Over the years, I’ve learnt that waiting for the perfect conditions to start our yoga practice is like waiting for Godot: it’s never going to happen. But does the mat we work on really matter? At Yogaville, we have three different types of studio mats all stored together and mixed throughout our pile. The mats are laid out flat, one on top of the other. There are black rubber ones more than 10 years old. They are soft but still firm, and give great traction. They also soften the impact of our beautiful (but not so forgiving) wooden floors. 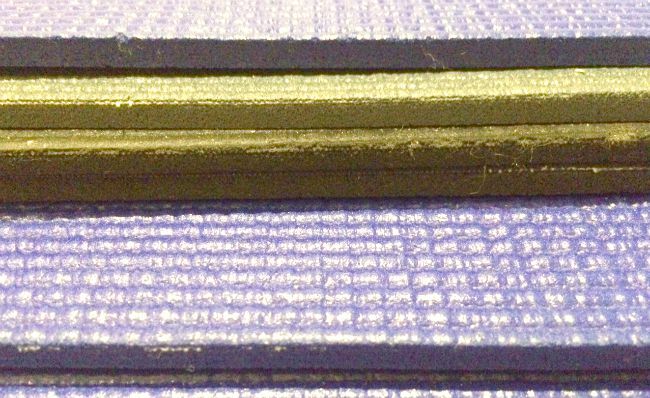 Our blue mats are the newest generation, and while initially slippery, are ageing well. Our grey mats however, the middle generation, are dense and quite firm. These are easily the least favourite of our students. My office is next to the table where our studio mats are stored, and I can hear the students as they prepare for class. Every day I hear them riffling through the pile to pull out their favourite type of mat, usually black. Some leave the pile smooth and unruffled. Others leave it looking like a broken bitumen road after an earth tremor. I, too, am guilty of seeking out a black mat. But often I choose the one from the top of the pile regardless of colour. And guess what? It makes absolutely no difference to my practice. I don’t suddenly find myself being able to do Kapotasana, or my repetitions of Bakasana soaring from 2 to 20. No. It still all relies on me and the work I do on the mat, not the mat itself. Before my first visit to RIMYI in Pune – the home of Iyengar yoga in India – my teacher at the time ran through the do’s and don’ts of practice hall etiquette. Do wear a t-shirt, not a singlet. Do wear shorts, and not leggings. Do follow Geeta’s instructions, no matter what. But there was one other instruction which my teacher gave me for Pune that has stayed with me: “Take the mat from the top of the pile”.